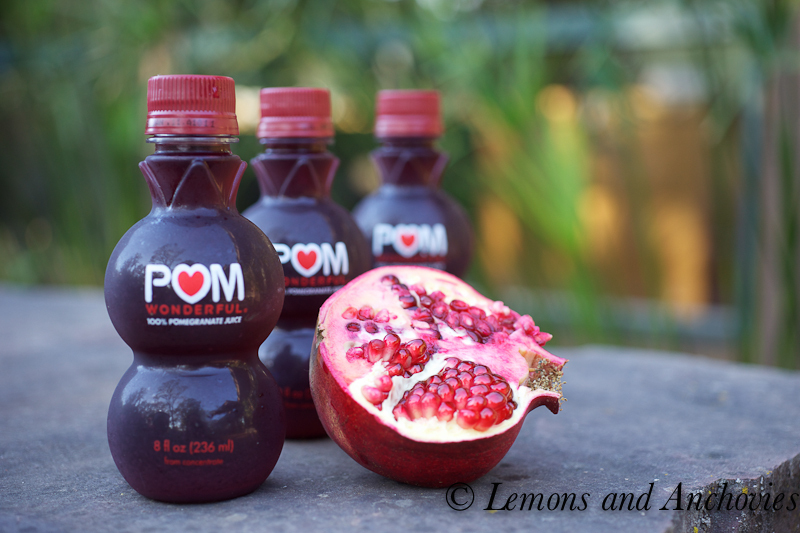 The good people at POM Wonderful sent me a case of their delicious 100% pure pomegranate juice a couple of weeks ago. What a delicious surprise! Who doesn’t like POM juice? By now, we are all familiar with this antioxidant-rich fruit but besides this, its juice is a winning addition to some tried-and-true dishes. I’ve used it quite a bit in my salad dressing for a fruity punch but this week I decided to let the juice take center stage by using it in my main course. I was inspired to prepare a dish that I haven’t made in at least eight years. 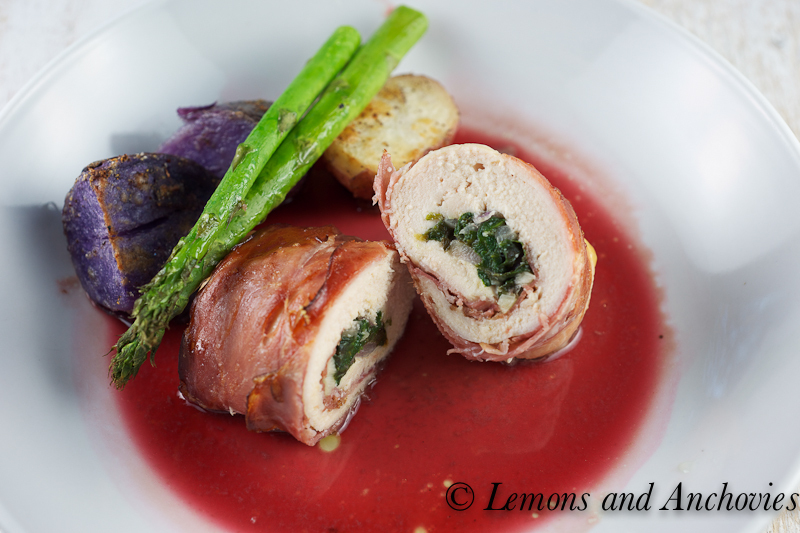 I really couldn’t find a good reason why this chicken roulade has fallen out of rotation so I decided to bring it back and give it a fresh, colorful makeover with the POM pomegranate juice. 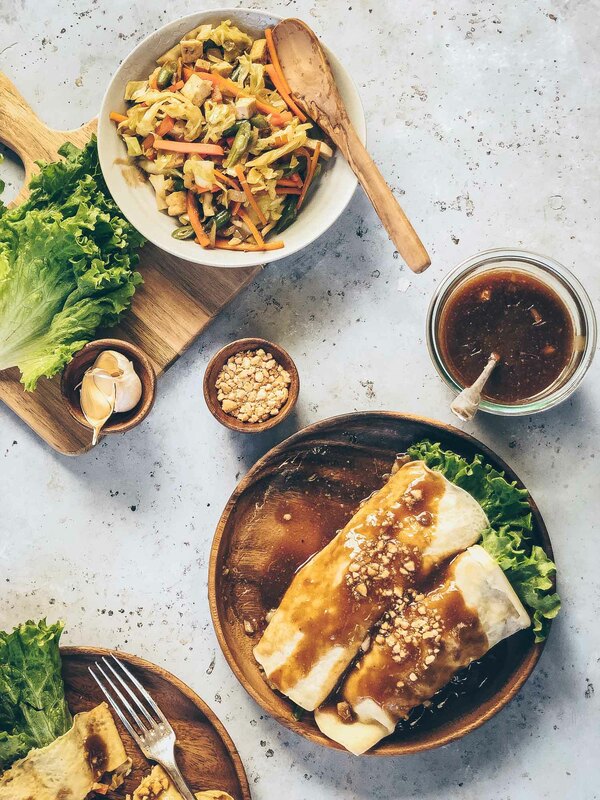 This dish turned out to have the perfect balance of flavors. Even with the moist chicken breast encasing the delicate spinach and shallots, both by themselves would be a tad bland for my taste. Wrapped in salty prosciutto, however, I got the flavor kick I was after so each bite would have more impact. But what rounded out the flavors best was the pomegranate reduction. The fruity, slightly-sweet addition satisfied my desire for more multi-dimensional flavor. A little salty, a little sweet–they were both present. The textures worked well together, too. The soft spinach paired nicely with the tad-crisp prosciutto. And of course, the bright roasted potatoes and the asparagus had to join the party, too, don’t you think? Thanks POM Wonderful, for my lovely gift! Preheat your oven to 350ºF and prepare the spinach filling. Sauté the shallots in olive oil and when translucent, add the spinach. Salt lightly, if desired. Cook on medium heat until the spinach has wilted and set aside. To prepare the roulades, place a pounded chicken breast half on two slices of prosciutto. Divide the spinach filling into four equal portions and place on one end of each chicken breast. Roll carefully and set on a baking tray. Bake for about 20-25 minutes. I like to check mine at the 18-20 minute mark just to make sure the chicken doesn’t overcook. To prepare the reduction, Heat the pomegranate juice in a small saucepan and cook until reduced by half, about 15 minutes. Take off the heat and add the honey if it’s not sweet enough for you. Whisk in butter. This is a beautiful dish, love the colors! 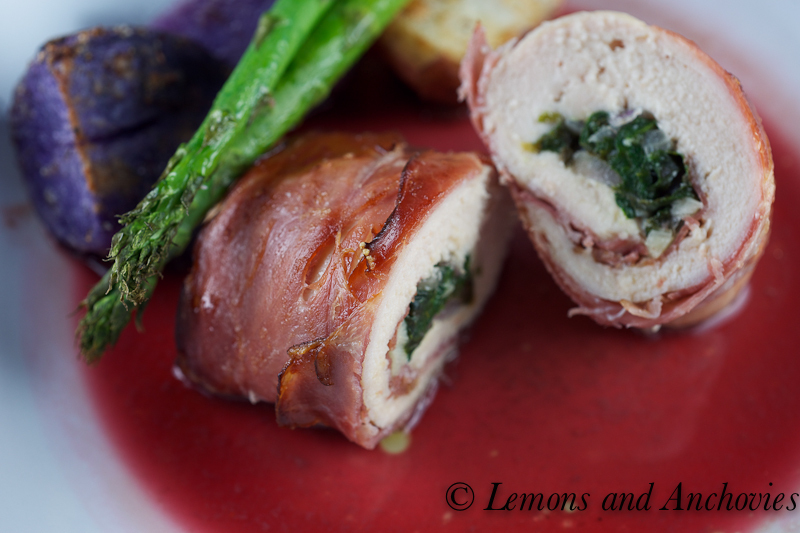 Chicken with a spinach filling is definitely a favorite of mine. What beautiful roulades, Jean! 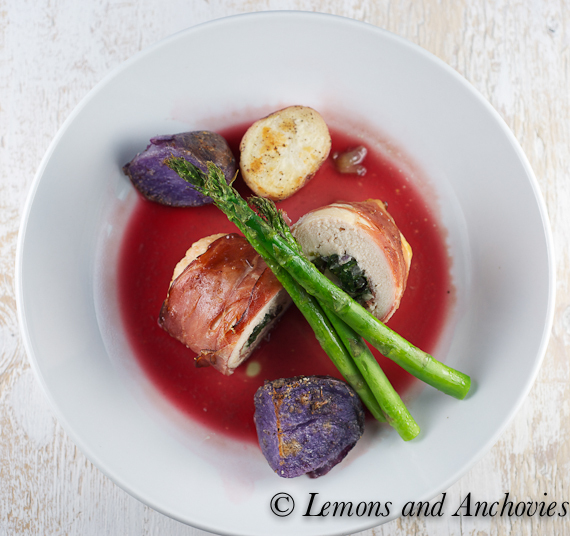 Your presentation is absolutely gorgeous and I love the contrast between the purple potatoes, green asparagus and POM reduction! Thank you for bringing back an old friend. 8 years is much too long! 🙂 Have a nice weekend! 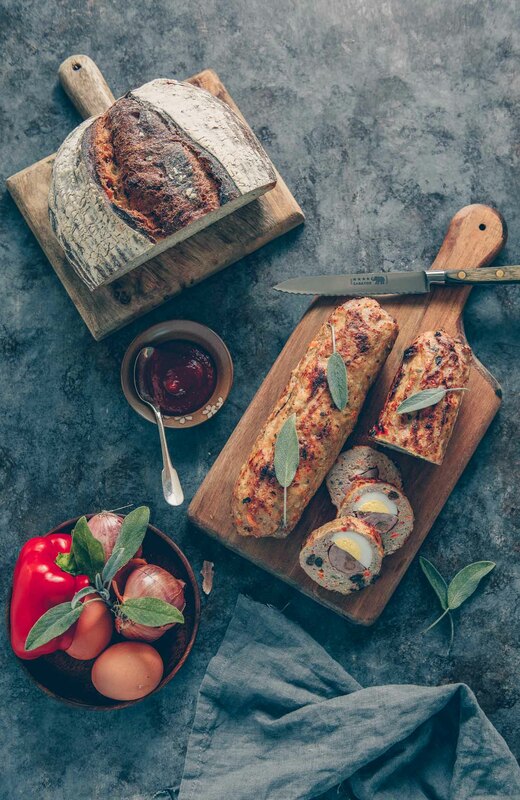 Impressive and tasty… Perfect meal for entertaining. 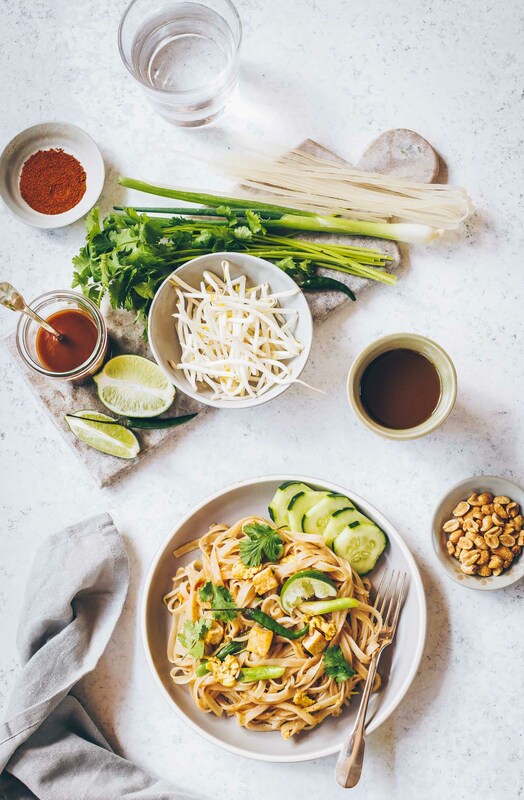 I am absolutely buying a bottle of POM the next time at the grocery so I can make this dish! Prosciutto is one our faves around the house so this is calling my name! Can I please come over for dinner? You did an amazing job with this dish…and I loved the first photograph of the POM juice and the pomegranate…you should shoot their publicity shots. This meal looks unique, elegant and most importantly, delicious. Thanks for sharing another great post! What an amazing dish!!! Looks incredible!! Wish I had it right in front of me now. Looking forward to seeing you and your husband tomorrow! That is the kind of meal that I would love to have on a regular basis. That’s really a beautiful dish! This looks like restaurant quality stuff! Well done girl! How could this ever have fallen out of rotation? I could live on it for a month. Delicious and beautiful! What an elegant dish ! Love the combination of proscuitto, spinach and pomegranate . Great job ! What a beautiful presentation!!! I do love POM, those folks are wonderful! Your pomegranate reduction was a perfect touch to that gorgeous stuffed chicken!! I see the people at Pom were very generous as I was a lucky recipient also! I love how you used it in this delightful looking dish.